This is the first of a three-part blog post on deploying monitoring addons with Nutanix Karbon. Nutanix Karbon is a curated turnkey offering that provides simplified provisioning and operations of Kubernetes clusters. Kubernetes is an open-source container orchestration system for deploying and managing container-based applications. Karbon was released in Tech-Preview after the launch of AOS 5.9 and Prism Central 5.9 in October 2018. We’ve received several queries from our customers, partners and peers alike who value the simplicity that we bring to the table for Kubernetes, but they find it hard to understand how the cluster is behaving and what is going on under the covers. Enter Prometheus (also known as Prom or P8s). Prometheus is an open-source monitoring tool that was built by a team at SoundCloud and it was inspired by Google’s Borgmon, it was designed from day one for the Kubernetes model of assigning and managing units of work. Prometheus has an expression browser for ad hoc visualization, However, Grafana is typically used as a visualization dashboard on top of Prometheus. A working Karbon Cluster with an internet connection. I used Kubernetes 1.10.3. These will be the steps that we will be performing at a high level. Expose a NodePort to access Grafana. Helm is a Kubernetes Package Manager which uses Helm Charts to help you define, install and upgrade applications which were built for Kubernetes. Lets go ahead and install Helm. Let’s first create a RBAC Cluster Role. Use Kubectl to connect to your Karbon Cluster then apply the following Manifest. The following manifest creates a ClusterRole called “HelmRole” and assigns the role RBAC permissions. Note: These permissions essentially allow full access to the entire Karbon Kubernetes Cluster, hence use it with caution. Not recommended for production. For production use we recommend the RBAC rules be reviewed in a more stringent manner. @JoseNutanix will share on a more secure manner for using Helm in a Tillerless fashion in the future. Once that’s done, use kubectl to apply the manifest to the Karbon Cluster. Once the ClusterRole has been created, our next step is to create a ServiceAccount for Helm to use. 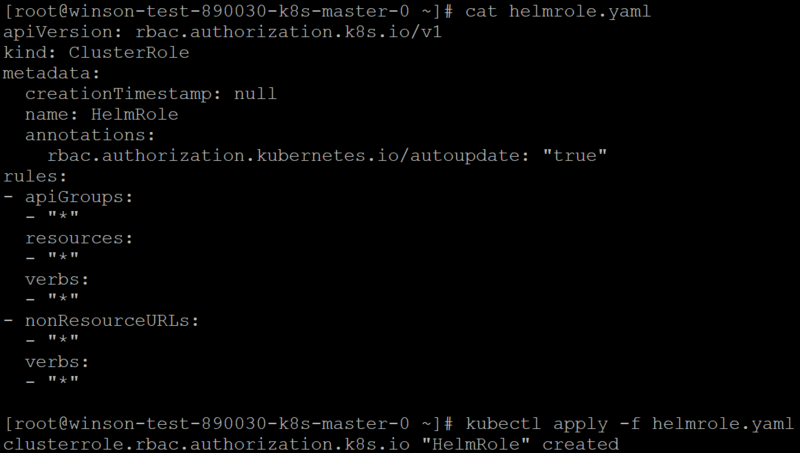 The following Manifest creates a ServiceAccount called “helm” in the kube-system namespace. Once the ServiceAccount has been created, our next step is to create a ClusterRoleBinding to bind the ClusterRole to the ServiceAccount. The following Manifest creates a binding of the “HelmRole” ClusterRole to the “helm” ServiceAccount. Now that we have created and configured the ClusterRole, ServiceAccount and ClusterRoleBinding, we can go ahead to download and install Helm. Execute the following from your terminal. It will download the Helm Installer script. Next, Let change the permissions of the get_helm.sh file so that we will have permissions to execute it. Execute the following from your terminal. Now lets execute get_helm.sh to download and install Helm. Once downloaded and installed, we now need to initialize Helm and to use the ServiceAccount we created earlier. Congratulations! You now have Helm installed on your Karbon Cluster. Lets move on to the next step. First, lets add the CoreOS Helm repository into Helm. Execute the following to add the repository. Now that the repository has been added, we can go ahead and deploy the Prometheus Operator. Done! Now have deployed Prometheus. Easy huh? 2 more steps are required before we can access the Dashboard. First lets deploy the kube-prometheus Helm Chart to configure Prometheus and Grafana for us. Now we have Prometheus and Grafana configured. Lets expose a NodePort for us to access Grafana. The following Manifest will create a NodePort Service on Port 30900. We now have Prometheus and Grafana deployed with a NodePort exposing 30900 to Grafana. Lets go ahead and access Grafana. You can access the Grafana Dashboards by navigating to https:// where NodeIP is the IP Address of any Karbon/Kubernetes Worker Node. 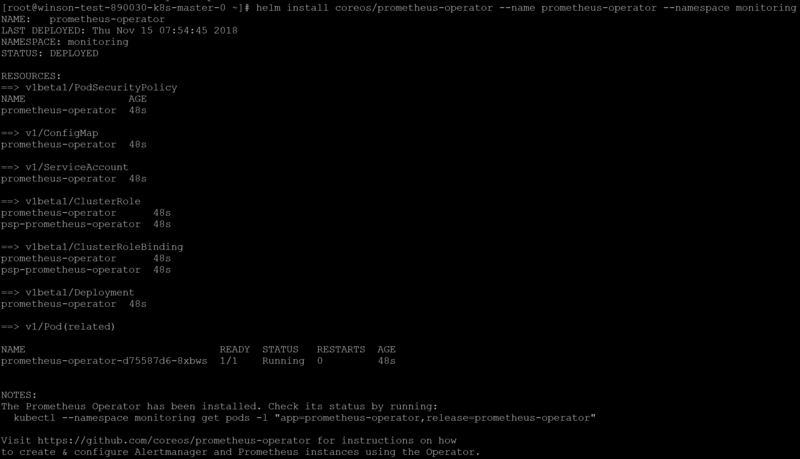 You can check for the IP Address using Prism or running the following kubectl command. We can click on the Home Icon to get a list of pre-seeded dashboards that are available. 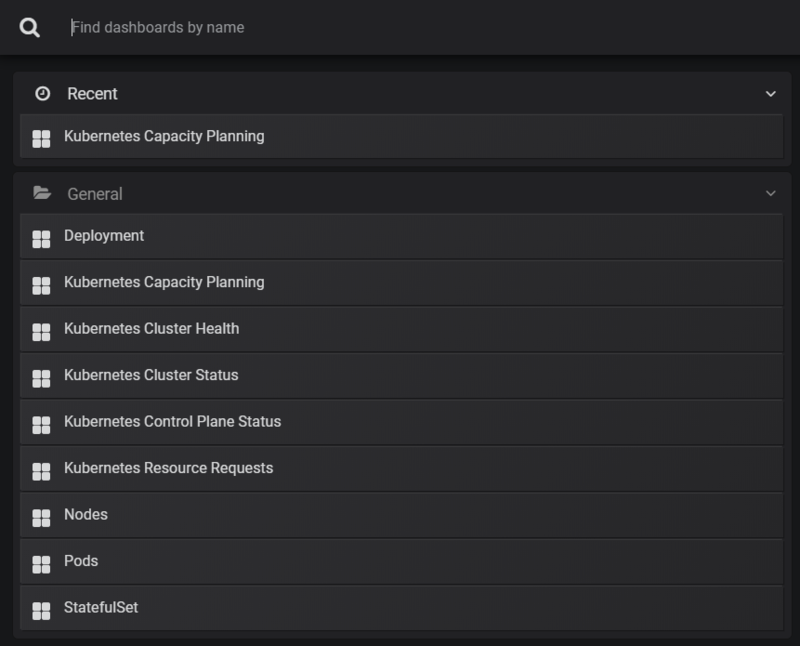 Here’s a Sample of the Kubernetes Capacity Planning Dashboard. I hope this has been helpful. I'll be updating this post with the steps to use tillerless in the future. In my next post, I’ll be sharing on how to deploy Nutanix Epoch on a Karbon Cluster. Nutanix Epoch is an Application Tracing and Performance Monitoring Tool. It has the ability to perform tracing of applications running as Containers or Microservices. It works around the principals of the 4 golden signals by Google, namely Latency, Traffic, Errors and Saturation. Epoch can be deployed on Karbon or vanilla Kubernetes Cluster to monitor the health as well as map the dependencies of applications as well as the ability to give our customers insights when your services are starting to happens or if an application stops working. Credits to: Denis Guyadeen, Jose Gomez for helping with this blog post.